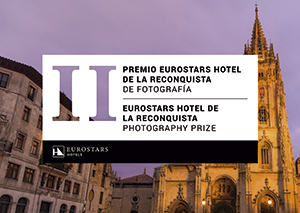 Hotusa Group invites all citizens and visitors to participate in the 2nd EUROSTARS DE LA RECONQUISTA PHOTOGRAPHY PRIZE. The contest winners will be the authors of photos that the panel of judges deems to best reflect the theme: “Oviedo, history in its streets”. From its possession of the capital of the Kingdom of Asturias to 812, Oviedo has become one of the most important historical enclaves in the area. In the historical center of undisputed medieval roots, we find a contemporary route of simple itinerary for the visitor wanting to discover the city. The pedestrian streets, without the presence of cars, create a feeling of returning to the past wide and enveloping, making walking around Oviedo a pleasure. From the University to the Cathedral, through the Palace of the Marquis of San Felix to Camposagrado, the visitor and the photographer can enjoy a journey through the history that emerges from the streets of Oviedo, capturing the history and the passing of the years have been shaping the city and filling it with memories and memories. Anyone interested in participating in the contest may do so before the April 29, 2019 on the site dedicated to the contest, where they can upload a maximum of three different series. To do this, they must load their works on the site following the established format: a series of three photographs that, as a whole, comprise an artistic unit. Each participant can deliver a maximum of three series. To present the photographs online, participants must upload a single canvas of 30 x 100 cm in which will appear the three photographs and the 5 cm spaces between them. The works must have a recommended weight of between 1 and 6 MB. (See more details in the competition rules). The winner will receive €1,500 and the 9 runners up will receive a free stay at the Eurostars hotel of his election.